Just like popular American theme parks, the most important thing you must remember about Haywards Heath is that you won't be able to see and do it all in one day. Unlike popular American theme parks, people that work in Haywards Heath are allowed beards. Clair Hall is the artistic hub of Haywards Heath's cultural wheel and in 1999 celebrated its 25th anniversary. Its numerous halls perform many functions. The main hall is used as a cinema, theatre, comedy club and the annual bridge competition is not to be missed. It is filled on a regular basis. Clair Hall has hosted the College Ball on several occasions and I once went to a friend's 6th birthday party there. Jon Day did the magic. As well as the elaborate golf course Haywards Heath boasts a wonderful Leisure Centre. Its facilities combine the traditional water sports of swimming and diving with some of toady's more modern activities. On Sunday morning there is a couples only sauna (you do not have to be married), please book early to avoid disappointment. With its extensive network of cycle paths, Haywards Heath is ideal for bikes of all kinds and those who like to mount and ride them for relaxation purposes. The cycle path network extends some 65m along the A272 providing a picturesque run between Haywards Heath and the adjacent village of Cuckfield. Since the cycle path is unconnected to any points where your journey may commence you will have to use the public highway to fully exploit this particular leisure feature. If you look closely you'll notice that the driver of the red Peugeot shooting-brake has come fully prepared with a tailgate mounted cycle rack. We advise you to only use your cycle on the highway if you have passed your Cycling Proficiency Test (or other nationally recognised equivalent) and are displaying your official handlebar mounted badge and functioning alert bell (yellow junior sized loud halers that play 3 types of emergency service siren are not acceptable). 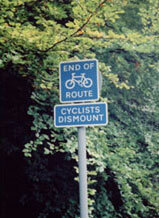 Remember to dismount your cycle as and when local signs advise. Probably a year ago the B2, formerly the 7-11, rebranded itself as Budgens Express. Budgens used to have a major presence in the town occupying the site now occupied by Trading 4 U formerly occupied by Sainsburys prior to it being occupied by Budgens. In spite of its rebrand the Budgens Express continues to be a meeting point for poorly disciplined youths dressed in white sport suits. We understand such youths are known as chavs (pronounced charvs). If you are a youth and like to congregate around the Budgens Express perhaps you'd like explain yourself using our electric letter facility. 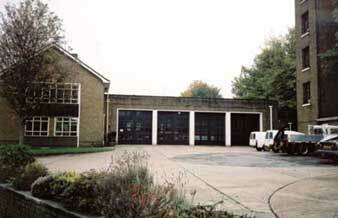 If you are very lucky, Haywards Heath fire station might be having an open day when you visit. Sometimes they parade junior fire persons around the forecourt in the style of National Service. The fat ones are made to climb to the top of the tall burning building simulator until they puke up all the dino-bites they ate for lunch. LIVE! pictures 24x7x365 from Haywards Heath. Go there now and see what's happening.